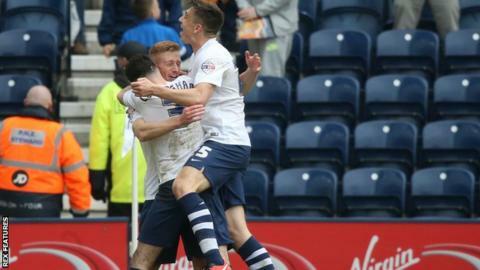 Eoin Doyle scored a stoppage-time equaliser as Preston North End salvaged a draw against Queens Park Rangers. The on-loan Cardiff striker headed in Greg Cunningham's cross in the second minute of added time at Deepdale. QPR had taken a fifth-minute lead as Sebastian Polter headed in Alejandro Faurlin's cross from close range for his seventh goal of the season. Preston are 10th in the Championship, nine points from the play-off places with QPR two points behind them. The hosts dominated after going behind to Polter's early goal, with Jordan Hugill and Daniel Johnson both going close for Simon Grayson's side before Adam Reach squandered one of their best opportunities when he scuffed a volley well wide. Rangers' top scorer Tjaronn Chery had two opportunities to double the lead in the 83rd minute, curling a 30-yard free kick just wide before going clean through on goal only to be denied by keeper Anders Lindegaard. Preston continued to be profligate in front of goal before Doyle's late equaliser, and the Irish striker had an opportunity to win it for North End a minute later but his header was straight at Alex Smithies. Preston manager Simon Grayson: "We've got good character and good spirit about us and I thought it was the least we deserved. "We played well, passed it well, but just lacked that little bit of quality in the right areas. We kept on asking questions and got a justifiable equaliser. "We've got some really good results so that breeds confidence. It's another positive result for us. The players have given everything they've got and showed the spirit required to get something out of games." QPR boss Jimmy Floyd Hasselbaink: "We should have got the three points. In the first half they put pressure on us but we soaked it up. "We passed the ball well and I didn't see them scoring. You have to take chances to make it 2-0 but it wasn't meant to be. "We take a lot from this performance today. We have to take the result on the chin, decisions went against us, we didn't take some chances but the performance was good." Match ends, Preston North End 1, Queens Park Rangers 1. Second Half ends, Preston North End 1, Queens Park Rangers 1. Grant Hall (Queens Park Rangers) is shown the yellow card for a bad foul. Anders Lindegaard (Preston North End) wins a free kick in the defensive half. Alejandro Faurlin (Queens Park Rangers) is shown the yellow card. Jermaine Beckford (Preston North End) is shown the yellow card. Gabriele Angella (Queens Park Rangers) is shown the yellow card. Attempt saved. Eoin Doyle (Preston North End) header from the centre of the box is saved in the centre of the goal. Assisted by Paul Gallagher with a cross. Goal! Preston North End 1, Queens Park Rangers 1. Eoin Doyle (Preston North End) header from the centre of the box to the bottom left corner. Assisted by Greg Cunningham with a cross. Offside, Queens Park Rangers. Alex Smithies tries a through ball, but Sebastian Polter is caught offside. Substitution, Queens Park Rangers. Grant Hall replaces Tjaronn Chery. Attempt blocked. Tjaronn Chery (Queens Park Rangers) right footed shot from outside the box is blocked. Assisted by Sebastian Polter with a headed pass. Substitution, Preston North End. Jermaine Beckford replaces Adam Reach. Attempt blocked. Paul Gallagher (Preston North End) right footed shot from outside the box is blocked. Assisted by Jordan Hugill. Attempt saved. Tjaronn Chery (Queens Park Rangers) left footed shot from the centre of the box is saved in the bottom left corner. Assisted by Sebastian Polter with a through ball. Attempt missed. Tjaronn Chery (Queens Park Rangers) left footed shot from outside the box is close, but misses to the right from a direct free kick. Offside, Preston North End. Calum Woods tries a through ball, but Adam Reach is caught offside. Substitution, Preston North End. John Welsh replaces Callum Robinson. Substitution, Queens Park Rangers. Massimo Luongo replaces Jamie Mackie. Attempt saved. Junior Hoilett (Queens Park Rangers) right footed shot from the left side of the box is saved in the top centre of the goal. Assisted by Jamie Mackie. Attempt blocked. Tjaronn Chery (Queens Park Rangers) left footed shot from outside the box is blocked. Assisted by Karl Henry. Attempt missed. Adam Reach (Preston North End) left footed shot from outside the box misses to the right. Assisted by Daniel Johnson following a corner. Corner, Preston North End. Conceded by Tjaronn Chery. Foul by Clint Hill (Queens Park Rangers). Junior Hoilett (Queens Park Rangers) is shown the yellow card. Jamie Mackie (Queens Park Rangers) wins a free kick on the right wing.